Named after a bay that has since been covered up, Luwan is one of Shanghai's most prestigious districts. Luwan has magnificent examples of European-style 19th and early 20th century homes, with many garden homes, villas and apartments. Apart from the restored colonial properties, there are many low and high-rise residences in among the area's many small art galleries, quaint bars, airy coffee shops and unique boutiques that line the busy road of Huaihai. There's also the Ruijin Road neighbourhood, around the Ruijin Guest House, which once housed Mao Zedong and other Communist Party heads. Like many of the neighbouring roads in Luwan district, Ruijin Road offers some refuge from the noise of Shanghai. The French Concession (a prime area) still has some of its old Parisian air. This elegant neighbourhood retains much original western architecture, built over 100 years ago. Its beautiful promenades are lined with lofty trees, originally imported from France. On weekends these sophisticated boulevards are dotted with residents window-shopping or sipping tea and people-watching from open air cafés. This district hosts the former residences of some of China's great historical figures, including Mao Zedong and Sun Yat-sen. The French Concession is highly coveted by both locals and expatriates alike, because of its excellent location near Shanghai's CBD, near retail and entertainment facilities, and because of its distinct architecture. 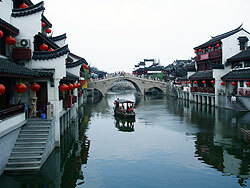 It is perfect for individuals wanting the convenience of the city, but also the ambiance of old Shanghai. There's also the happening street of Xintiandi. Developed by one of Hong Kong's largest real estate developers, Xintiandi has established itself as the Beverly Hills of Shanghai. It's a popular spot for Shanghai's young and beautiful people, with expensive restaurants, posh clubs, and high-end shops. It's a sought-after zip code, as technically it is still part of the former French Concession. Both locals and foreigners are attracted to this area as they have a choice of luxury town houses, apartment complexes and renovated lane houses to choose from. There is a lot to do in the area, conveniently on several subway lines.